Do you like to read? Are you looking for ways to stimulate your mind and spirit? Do you want to meet new people and share your ideas of faith and belief? Whether you are an avid reader or an occasional recorded book listener you may enjoy joining fellow parishioners (and guests) for monthly informal discussions on spirituality and the human experience. The St. Francis of Assisi Book Discussion Group will meet after the 11 o'clock Mass on Sunday, May 19, 2019. (We will be skipping our April meeting since the third Sunday of April is Easter Sunday.) 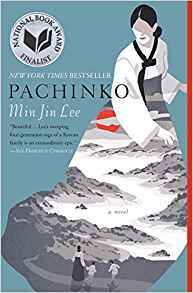 At that time we will discuss Pachinko by Min Jin Lee. All are welcome to take part in the Book Discussion Group!